So, I've done a post on blue, and also green, and now it's time for orange. Many people think that perhaps it's a difficult colour to wear, but I think that's more in theory than in practise - try it, you might like it... not least because it's a key colour of SS2012. Pair with navy to keep it looking chic. 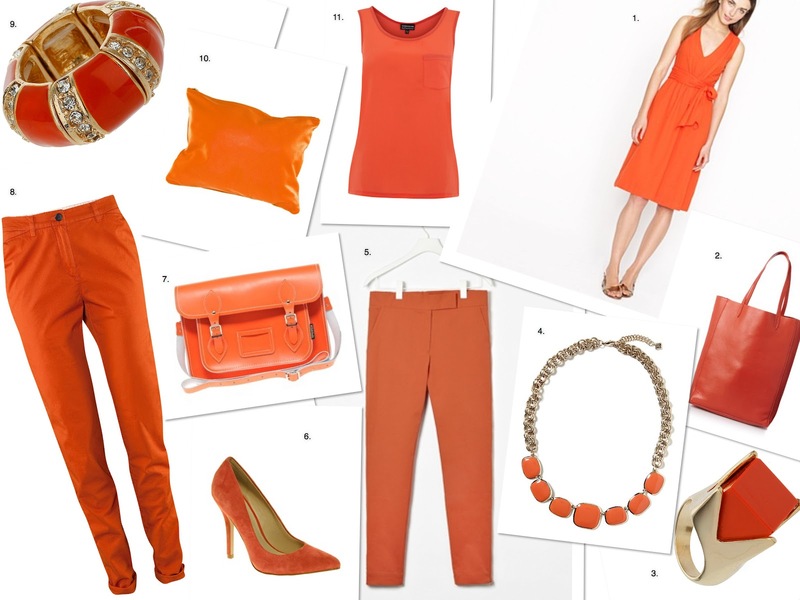 But if you're not convinced of its top to toe suitability, there are plenty of orange accessory options to buy into. To encourage you further, here are some pics of ladies who have got fully on board the tango train, and look rather fabulous. And here are some high street options. Now the sun's out, it seems like a good time to go and invest in some citrus brights. 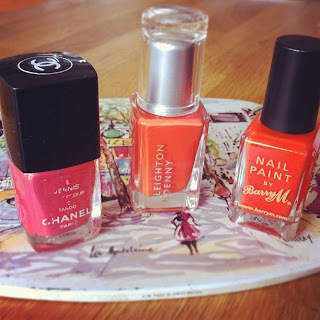 And then there's always the option of wearing an orange nail polish - a friend bought me the one on the right, from purse-friendly Barry M, and it's really rather good. It's my favourite of the three - it's number 301 Block Orange. The battered Chanel one on the left is called Tango - now discontinued, but a fab colour for the toes - looks pink next to the other two, but it's definitely a coralish orange. And the Leighton Denny one is Do Me A Flavour, and was free with a magazine - it's a bit no-man's land for me though - almost bright enough but just not quite there. Nice consistency and coverage though.